The first awards for individual meritorious achievements in motion pictures were announced yesterday by the Academy of Motion Picture Arts and Sciences. The fifteen awards are for outstanding achievements for 1928 and were made after an exhaustive survey. As a reward for and in recognition of their efforts in raising the standards of motion pictures the winners are to be presented with statuettes in bronze and gold, designed by George Stanley, sculptor, under the supervision and selection of Cedric Gibbons, art director at the Metro-Goldwyn-Mayer studio. The statuette is twelve inches high with a Belgian marble base and consists of an idealized male figure standing on a representation of a reel of motion-picture film. It was announced the trophies will be presented at a later meeting of the academy at the Roosevelt Hotel in Hollywood. 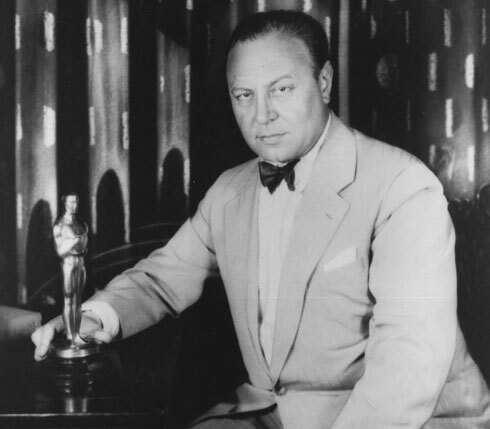 Emil Jannings, first award for his outstanding performances in The Way of All Flesh and The Last Command. Honorable mention to Richard Barthelmess for his performance in The Noose and The Patent Leather Kid. 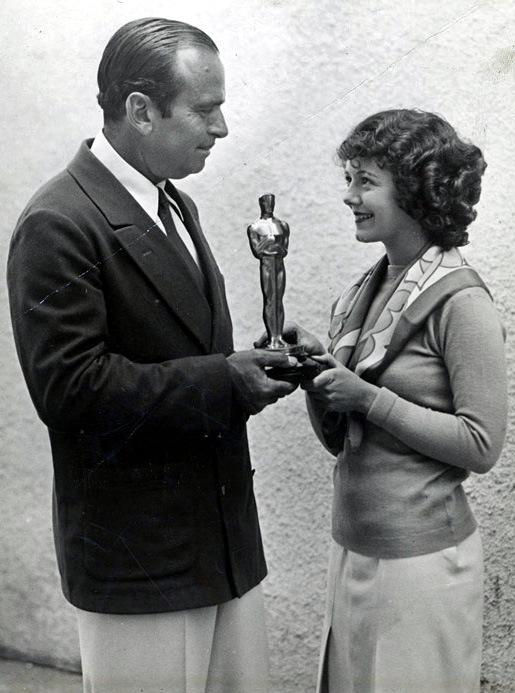 Janet Gaynor, first award for best performances among actresses in Seventh Heaven, Sunrise and The Street Angel. Honorable mention to Gloria Swanson for performance in Sadie Thompson and to Louise Dresser in A Ship Come In. For direction of dramatic pictures, Frank Brozage received first award for Seventh Heaven. Honorable mention to Herbert Brenon for his directorial work in Sorrell and Son and to King Vidor for The Crowd. Lewis Milestone received first award for directing a comedy picture, Two Arabian Knights. Honorable mention to Ted Wilde for Harold Lloyd’s Speedy. The first award for writing an original story was given to Ben Hecht for Underworld with honorable mention to Lajos Biros for The Last Command, while Benjamin Glazer received first award for adaptation of Seventh Heaven with honorable mention to Alfred Cohn for adapting The Jazz Singer and to Anthony Coldewey adapting Glorious Betsy. For title-sriting the first award went to Joseph Farnham with honorable mention to George Marion, Jr., and Gerald Duffy. The cinematography award is shared by Charles Rosher and Karl Struss for Sunrise. George Barnes gets honorable mention for his work in Sadie Thompson, The Devil Dancer and Magic Flame. The art direction award was given to William C. Menzies for The Tempest and The Dove, with honorable mention to Rochus Gliese for Sunrise and Harry Oliver for Seventh Heaven. The engineering effects award goes to Roy Pomeroy for Wings, with honorable mention to Nugent Slaughter and to Ralph Hammeras. 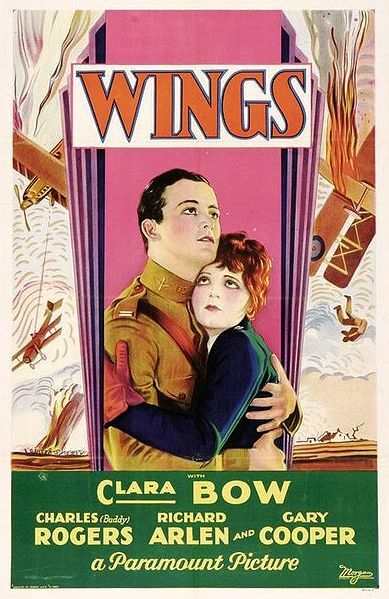 The Paramount Famous Lasky Corporation received the first award for the production of the outstanding picture of the year, Wings. Honorable mention went to the Fox company for Seventh Heaven and to the Caddo company for Two Arabian Knights. This is the only award which was decided on box-office returns. 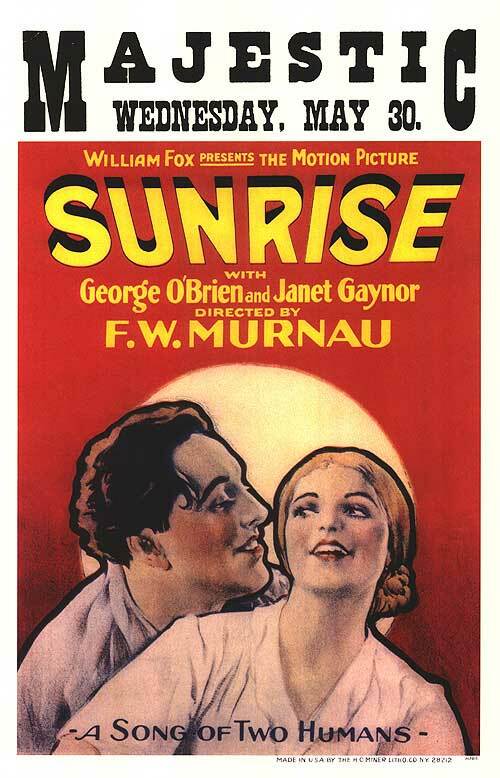 The Fox company won first award for the production of the most unusual and artistic picture, Sunrise, while honorable mention was received by Paramount for Chang and Metro-Goldwyn-Mayer for The Crowd. Special first award was given to Warner Brothers for producing the pioneer outstanding talking picture, The Jazz Singer, with Al Jolson, while another first special award was given to Charles Chaplin for acting, writing and producing The Circus. It was announced by the central board of judges which made the award that the board felt that Warner Brothers and Chaplin should be considered separately from the other award classifications owing to the unique character of their accomplishments. In deciding to make the first awards for individual achievements, the academy members made twelve classifications in addition to the two special awards. The nominations were turned in by the members last August. One thousand nominations were received and these were then referred to class committees consisting of five judges. These judges made three nominations which were then turned over to a central board of judges. This, it was explained, is responsible for the length of time taken in making the awards. The central board of judges was composed of Alec Francis, Sid Grauman, Frank Lloyd, and A. George Volck. The awards were made for pictures first publicly released during the year ending August 1, 1928, and is the first time the academy has made the awards. The preceding article is the announcement of the first Academy Awards from the Los Angeles Times in 1929. In the beginning the awards were announced before the ceremony instead of being a surprise that night. Emil Jannings, one of Germany’s most favorite actors, was Swiss-born and was raised in Germany as a child. An undisciplined student, his first ambition was to be an actor, however a close friend who was in the Navy, convinced him to run away and go to sea. He eventually returned and tried to obey his parents wishes to be an engineer but soon ran off again and joined a theatrical road company. This time he was returned home by the police, but his father thought a good dose of theatrical hardship would cure him of his dramatic ideas and allowed him to continue with his pursuit. For several years he traveled with one company or another eventually becoming a stock member at Bremen and Leipzig. For some time Jannings was with the Darmstadt Royal Theatre in Berlin, where he played in Shakespeare, Ibsen, Strindberg and Goethe plays. There he made the acquaintance of Robert Wiene, who would later become the producer of Caligari. He soon played in a series of one-reelers in which one of the directors was a young Ernst Lubitsch. In F.W. Murnau’s, The Last Laugh (1924), in which Jannings plays an old man who sees his world fall about him, he caused critics to rave about him. After his success in Faust (1926), again with Murnau, he came to the United States for Paramount and appeared in The Way of All Flesh (1927), The Street of Sin (1928), The Last Command (1928), The Patriot (1928) and Sins of the Father (1928). In 1929, the first year of the Academy Awards, Jannings won a Best Actor award for his performances in the The Way of All Flesh (1927), in which he played an embittered family man, and The Last Command (1928), in which he was an exiled Russian general reduced to playing bit parts in war films. The first Academy Awards ceremony was held on May 16, 1929. However, at that time talking pictures had arrived and Jannings became one of that group of foreign actors who, because of their accent, was suddenly forced to abandon his career in the United States. Since the actor was returning to Germany on April 27 – before the banquet was to be held in the Blossom Room of the Roosevelt Hotel – he asked the Academy if he could receive his gold statuette early. The fledgling organization agreed, making his the very first Academy Award ever presented. The remainder of Jannings film work was done in Germany. During World War II, it became apparent that Jannings had become a favorite of the Nazi government, particularly since he was one of a handful of people entrusted by Propaganda Minister Joseph Goebbels with running that phase of the film industry most closely dominated by the Hitler regime. After the war he was not seen on the screen again. Emil Jannings died at his home in Strobl, Austria from liver cancer complicated by pneumonia on January 3, 1950. He was buried at Saint Wolfgang Friedhof Cemetery. The very first Academy Award won by Jannings is currently on display at the Berlin Film Museum.